Automotive companies are constantly facing new challenges and new demands such as international competition and increasing pressure to reduce costs and increase their performance. In this context, the use of certain types of software becomes a very important tool as a factor of differentiation of performance and quality compared to other companies. 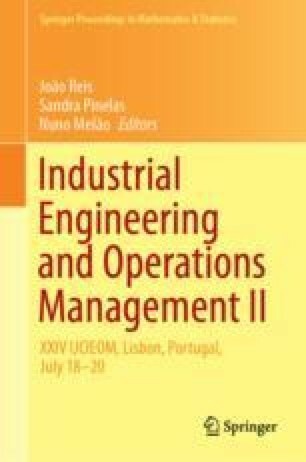 In this paper, a case study of a Portuguese automotive enterprise is considered in order to optimize the performance associated to a variable displacement oil pump assembly line. The objective is to implement and exploit the SAM (Suivi Arrêts Machine, in French, system for improving the means) software, a mechanism of control and monitoring of efficiency, in order to analyze which operations are more detrimental and which do not allow a determined production objective to be met. After the implementation phase, it will be necessary to define the indicators to be deduced from the software and to define the standard data collection and analysis. Afterwards, in order to disclose all the data, it will be necessary to create an animation board based on the Plan-Do-Check-Act Cycle (PDCA) to start monitoring the performance of the line and consequently increase its performance. This work was financially supported by the research unit on Governance, Competitiveness and Public Policy (project POCI-01-0145-FEDER-006939), funded by FEDER funds through COMPETE2020—POCI and by national funds through FCT—Fundação para a Ciência e a Tecnologia. Radu Godina would like to acknowledge financial support from Fundação para a Ciência e Tecnologia (UID/EMS/00667/2019).